It's near impossible to find a pair of high waisted jeans or trousers on the high street, (if you know of anywhere that sells them please share - but I don't like the "three button" style that Topshop have), so I love that River Island have a range of high waist trousers and leggings! I'm desperate to get my hands on a classic 80's pair, but I'm yet to find any. I love the PU leather detail on the pockets of these trousers, and I also love the colours - I can't wait to wear them in the winter with boots and a big, warm coat! Yesterday I chose to clash a little and wore them with a hyper floral print blouse from H&M and my Dr Marten shoes. You look fab Toni! They really suit you! I saw a pair of tartan brogue type shoes in RI and I can't stop thinking about them! River Island's autumn/winter stuff is amazing! Apparently they're more like the Topshop Leigh Jeans than actual jeggings but they come all the way up to your belly button. I haven't tried them yet but they may be worth a shot! Good ol' M&S! 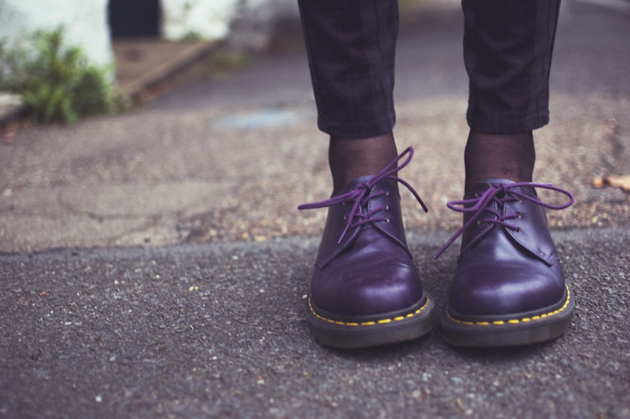 love your purple docs with purple laces. love your haircut & your glasses too. and that whole look for that matter. coming from someone who just discovered your blog yesterday: your blog is awesome! you work them super fab.... i love your style.... + were londoners woop! you look lovely! 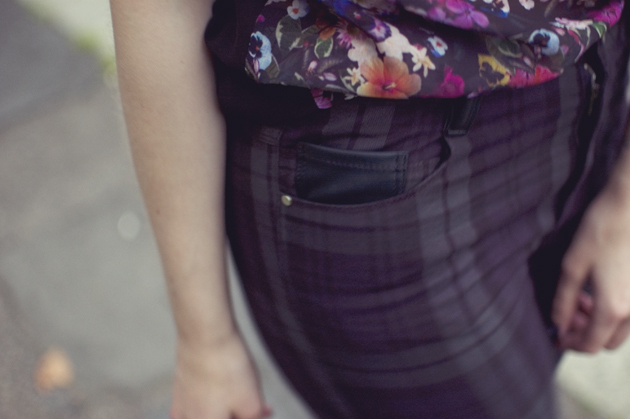 i always roll up my trousers to make them ankle grazers anyway ;) i think i've only ever found high waisted trousers that i actually like in charity shops, but thats obviously a bit hit and miss! 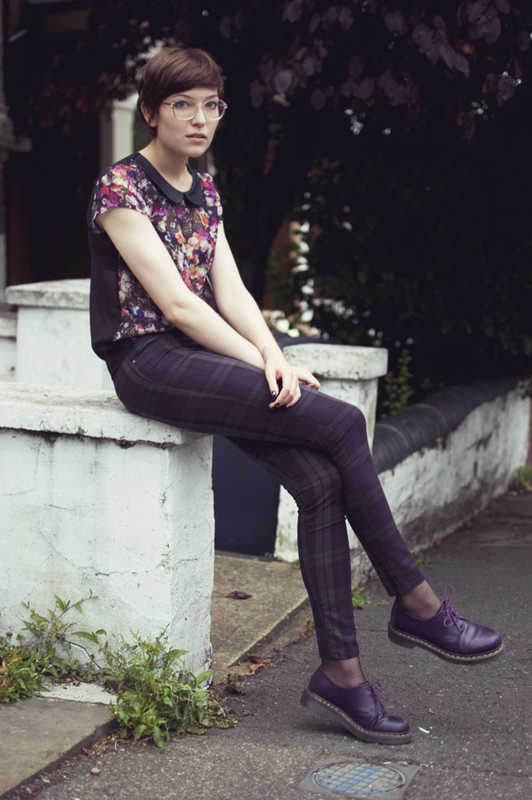 I love the trousers...I love the martens! Ahh I saw these in the lookbook and wanted them straight away, and now I want them even more after seeing you style them! Ankle grazers are still very much in for A/W even though it's not exactly practical to have bare ankles on cold days haha! love these trousers! 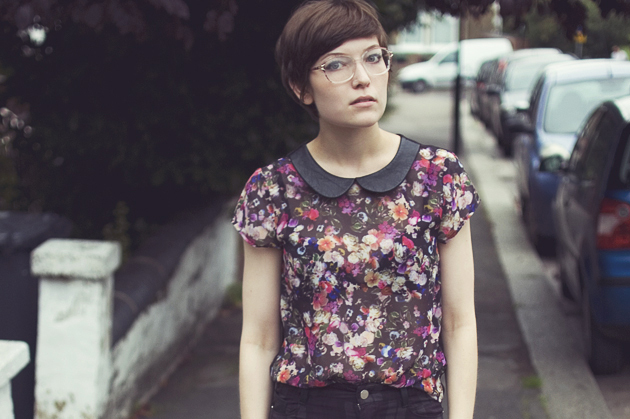 And with dr martens is exactly how I'd wear the, too. Hi there, can you post up the link to those pants?